PLAY SCULPT LIVE: Let There Be Light! Christmas is a couple of days away and getting this piece in to the PCAGOE Challenge is part of my getting ready for the holidays. Winter solstice is all about the light coming back so I see a good omen about making a piece that will diffuse light. The skies have been gray way too often around here so more light is what we all need. This piece was inspired by a ceramic bowl I saw on The Polymer Arts newsletter. I had already played a bit with the idea of removing clay from a bowl to let light through and was spurred on by the inspiration from Sage Bray. My first attempt was done this summer and I wasn't happy with the outcome and had let it sit so I could brew a solution to my discontent. My second attempt was closer but not quite the shape I had in my mind. My third and final attempt (the challenge due date was upon me) came out just right. In the end, I did manage to save the first two, turning them into pieces that I like. These last weeks of my 2014 Bowls Challenge are seeing me finishing pieces I made this year that were not quite right or not to my liking. The final piece is a multi-baked creation. I first baked the inside shape, then the outside elements were baked later. In all, the piece went in three times. What puzzles me the most is that the clay on the outside started out white. But each time it went in the oven it came out a little darker. It didn't burn but it's like the dark copper of the inside leached through to the white. I've never heard of that happening but that is certainly what it looks like. As most of my pieces, I ended liking it that way quite a bit. The "leaves" or "blades of grass" on the outside were treated to a little crackle paint to lighten them up and give them a contrasting texture to the pod like, spongy texture of the top part. I'm quite pleased with the results and it looks very cool in the dark all lit up. I use a battery tea-light and it flickers just a little. I'd like to thank all of those who have followed this Bowls Challenge for 2014 and I still have not decided which challenge I will choose for 2015. I learned so much about my art, my capabilities, about the medium by doing this series that I want to choose another theme that will continue my education and bring me that much further to finding my own voice. Now, all we can do is notice the days getting longer! Happy Christmas everyone! 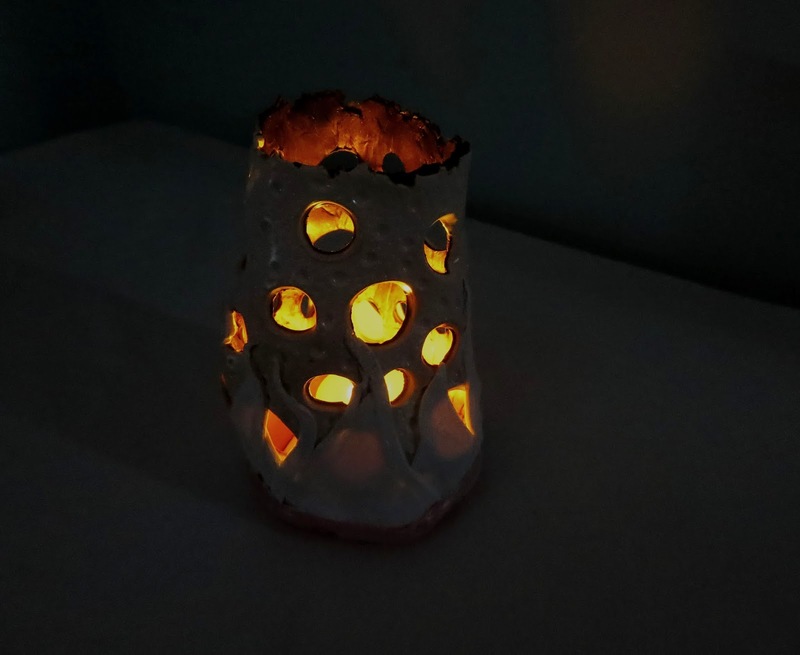 I love how this looks when it's lit, especially the lower areas where you can see the outer decoration overlapping the holes on the first layer. I've had whites (specifically pearl or those mixed with translucent) turn more amber with extended baking too and don't know what the cause is, but I agree, it works well for this piece and can't imagine it any other way! I look forward to reading about your next personal challenge theme for 2015! Thank you Beth. It is one of my organic pieces. And maybe one day I'll discover the why of the color change. It could have something to do with white being the absence of color so it will absorb the surrounding colors more. As for my 2015 Challenge Theme, I have chosen it. It will be revealed with the first piece soon. Thanks "Aims". It was rather simple. I used crunched paper for the armature. The finesse comes in keeping it upright when baking and re-baking. Sorry the photo is not great, it really does look cool in the dark.